The Best Laid Plans of Lon Chaney, Jr.
Lon Chaney, Jr., once portrayed the sweetest, most sensitive soul you’d ever want to meet. He was an easy-going fellow who wasn’t the least bit fussy. “I don’t need no fancy foods like beans with ketchup,” the character declared, and he meant it. But this sweet, sensitive soul was also dangerous. If you weren’t careful, he’d kill you. The 1939 version of Of Mice and Men is the first (and our favourite) retelling of the John Steinbeck story. 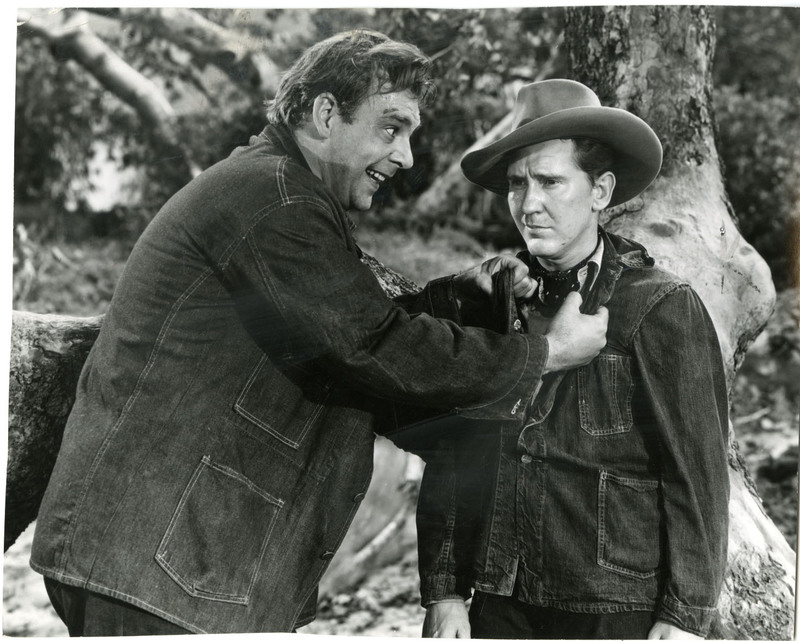 It received four Oscar nominations but none for acting, which is a doggone shame considering the cast included Burgess Meredith and our man Chaney, Jr.
Of Mice and Men was Lon Chaney, Jr.’s breakout movie. It made him a star. In the film, Chaney and Meredith are Lenny and George, migrant workers who travel throughout California. Chaney’s and Meredith’s characters are opposite to each other in every possible way. Chaney is tall and muscular; Meredith is small and wiry. Chaney’s character takes people at face value; Meredith sniffs for a motive. And, while Meredith is a fast thinker, Chaney is not. Chaney’s character has the mental capacity of a five year-old. Chaney is utterly convincing as the sweet-natured Lenny. His goal in life is to buy a small homestead with Meredith: they will have a little house, a cow, some chickens. And rabbits. It will be Chaney’s job to tend the rabbits, as he reminds Meredith all day, every day. Because he is mentally challenged, yet physically strong, Chaney’s character is fascinatingly complex. Chaney gives a remarkable portrayal, and never slides outside of character. Even when he’s not in the foreground, he’s still Lenny-esque, watching other characters with eager but slightly vacant eyes. When Chaney’s character is given a puppy, his face glows. This giant of a man sits cross-legged in the barn with the wee pup, cuddling it and scratching its ears. The puppy is his whole world, and he couldn’t be happier. We think it’s a scene of joy and we say, “Aww.” But it’s not. This is Chaney setting us up. It’s a mean trick he plays on us. All through the movie we suspect disaster is going to kneecap us, but we shove it aside. Chaney is guileless and trusting, and he suckers us into believing everything will be all right. Except it’s not. We are given a sudden, shocking glimpse into Chaney’s darker side when the boss’ churlish son (Bob Steele) attacks Chaney by hitting him in the face. Chaney, who’s been told to never fight back, covers his face with his hands and wails, “George, make him stop!” When Meredith gives him permission to defend himself, Chaney seems to fall into a trance. He simply reaches for Steele’s hand and crushes it. He doesn’t let go; he neither sees nor hears nor feels, while Steele writhes below him, shrieking with pain. You see? Chaney has led us to believe that something like this could never happen, not on our watch. But it does – and much worse, too, before the film is over. There have been four other versions made of the Steinbeck novella, Of Mice and Men. But for our money, no other actor comes close to capturing Lenny’s charming innocence as Lon Chaney, Jr. He is riveting as a man who is too dangerous for his own good. Of Mice and Men: starring Burgess Meredith, Betty Field, Lon Chaney, Jr. Directed by Lewis Milestone. Screenplay by Eugene Solow. United Artists Corp., B&W, 1939, 104 mins. This post is part of the CHANEY BLOGATHON, hosted by The Last Drive in and Movies, Silently. Be sure to check all the other entries! Really enjoyed this write-up, Ruth. I just saw this movie a week or so ago, and you are so right about Chaney’s performance. He WAS Lenny. He really was, wasn’t he? Such childlike enthusiasm and so likeable…yet so dangerous. In my opinion, no one has come close to depicting Lenny. Isn’t Chaney Jr. adorable in this movie? Well, adorable for the most part. He and Burgess Meredith have wonderful chemistry. Thanks for your kind words. The “beans and ketchup” comment made me LOL. A lovely post on one of Chaney Jr’s most memorable characters. It’s so heartbreaking to watch this film and see how this innocent man, through forces he can’t understand, is defeated by those forces. You make great points on this character’s dual nature and how it’s revealed throughout the story. Lenny is utterly defeated by those forces, like you said, and because he doesn’t understand them, he has no chance of controlling them. And that’s the real tragedy, no? I hate the way this movie ends, but no other ending makes sense. Wonderful breakdown of Chaney’s character! A darn shame that he wasn’t rewarded at Oscar time but what a powerhouse! I know 1939 would have been a tough year to choose Oscar nominees, but I think Chaney would’ve been a worth candidate. Every time I see this movie, I am amazed by his performance. This was an excellent analysis of what makes Lon Chaney Jr’s Lenny better than any other interpretation I have seen. He’s like a bear cub, cute but terribly dangerous. Thank you for sharing. This 1939 film really does blow you away, as you put it. The performances are just that good. I remember watching those Tex Avery-Looney Tunes cartoons on TV as a kid, but didn’t get the references to the movie. I’ll have to do a search on YouTube. As always, a great post. For once Lon Jr. got a great role and he was unforgettable. I completely agree. For once he DID get a great role and he was amazing. yes yes, and nicely put, he was good at being the sweet big lug and could be scary when angered. He was always a highly sympathetic presence which unfortunately some folks mistook for limited talent. Performances like this prove otherwise. thanks! Yes, the critics absolutely mistook his sympathetic presence for limited talent. It’s too bad he couldn’t have had a few more roles like this one. I have still to watch this film, because I already saw Chaney Jr’s name in several 1930s movies, but not always I succeeded in spotting him in the picture. I hope I can see it soon, I really like John Steinbeck. Thanks for stopping by, Le. I hope you get the chance to see this movie. Lon Chaney Jr. really is amazing here. I remember reading Of Mice and Men in English Literature in high school. Such a sad story. That is probably why I have stayed away from any of the movies, but you make me feel as if I should see this one. I appreciate you giving me reasons to see movies I might have otherwise missed, Ruth. Thank you! I love this 1939 version. Really, I think it is the best… which makes the ending especially hard to watch. I recommend it, but you do have to be in the mood.